There was no summer houses in Tornby Strand - In stead we shows summer houses in the neighbour villages to Tornby Strand. 4 persons 2 bedrooms Dishwasher Woodburner Distance to beach: 200 m.
Only 300 m to great beach. 3 persons 2 bedrooms Dishwasher Distance to beach: 300 m.
Wonderful cottage on high location in calm nature surroundings - close to Lønstrup beach and town. Fine views also to the sea. 140m2, 2 storeys with 2 double bedrooms and one twin-bed room. Dining room, lounge, sunroom, terrace, open fireplace and Wi-Fi. 6 persons 3 bedrooms Dishwasher Washing machine Woodburner Distance to beach: 3200 m.
Super lovely spa house of 89 m2 in 2 levels for 8 persons. 700 m from the sea, situated next to a nature area. The house is equipped with TV, DVD, washing machine, dishwasher, all kitchen facilities, playing house, equipment for children, etc..
8 persons 3 bedrooms Dishwasher Washing machine Whirlpool Sauna Woodburner Internet - Broadband Distance to beach: 700 m.
Energy-friendly luxury cottage of 127m2 for 10-12 people and within walking distance from Lønstrup. Large lounge with open kitchen, 4 bedrooms, large bathroom with spa, guest toilet and sauna. Particularly suitable for several families. 12 persons 4 bedrooms Dishwasher Washing machine Whirlpool Sauna Woodburner Pets OK Distance to beach: 900 m.
Really nice and spacious cottage with a nice view of the sea. The house has a floor space of 117 m² and was built in 2003. The house is suitable for 6 persons. 3 bedrooms, 2 bathrooms including one with whirlpool. 6 persons 3 bedrooms Dishwasher Washing machine Whirlpool Sauna Woodburner Pets OK Distance to beach: 50 m.
Nice holiday house, 77 m² suitable for 7 persons on a 4.000 m² nature property. Because of large trees you have a good protection against wind and insight. Child and pet friendly. The warranty for a nice holiday. 7 persons 3 bedrooms Washing machine Woodburner Pets OK Distance to beach: 1000 m.
Poolhouse for 11 persons. Suitable for 1 or 2 families. 500 meter to Lønstrup City and 800 m to the Northsea. Internet. 11 persons Dishwasher Washing machine Pool Whirlpool Sauna Woodburner Internet - Broadband Pets OK Distance to beach: 700 m.
Good cottage of approx. 60 m² for 5 persons and glimpse of the sea. 200 m from lovely, child-friendly sandy beach. 1 km from Skallerup Holiday Centre. Lounge/kitchen and 2 bedrooms. Roofed west terrace. 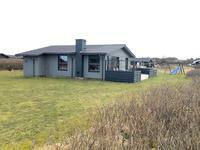 5 persons 2 bedrooms Washing machine Internet - Broadband Distance to beach: 200 m.
Cottage at Nørlev Strand. Accommodates 6 persons. Only 100m from the beach. Morning and afternoon terrace overlooking the sea and a secluded atrium. The beach is wide and sandy - no stones. 1.7km from Skallerup Seaside Resort. 6 persons 3 bedrooms Dishwasher Distance to beach: 100 m.
Well located luxury cottage for up to 8 people in Skallerup north of Lønstrup within walking distance to Skallerup Holiday Resort. The cottage is located in beautiful nature area. It has a lounge, open kitchen, 4 bedrooms, bathroom, spa and sunroom. 8 persons 4 bedrooms Dishwasher Washing machine Whirlpool Sauna Woodburner Internet - Broadband Pets OK Distance to beach: 1000 m.
4 persons 2 bedrooms Washing machine Woodburner Internet - Broadband Pets OK Distance to beach: 200 m.
New cottage for 8 persons. All accomodations, Whirlpool etc. 2500 m2 nature property. 600 m to the Northsea. Wonderful sandy beach. Pets OK.
8 persons Dishwasher Washing machine Whirlpool Sauna Pets OK Distance to beach: 800 m.